Now that the sunny weather is in full swing it is about time you started shading your eyes and protecting your head with one of our brand new five panel caps. Available in two equally fly designs, these caps will keep you cool through the right scorchers we have ahead of us. Bad hair day? Not anymore when you kit yourself out with one of our Dash Caps. This speckled delight comes equipped with its own Oaf label allowing you to wear our name in pride. 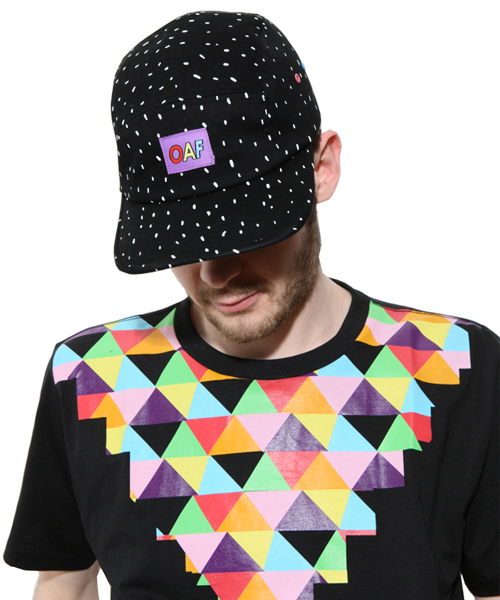 The Dash cap looks particularly pleasing teamed with our Aztec T-shirt. Look like the hottest dawg in town when you get your hands on this Cap. The Oaf Dawg has its own pair of ears that you can wear down or clip up with a popper button fastening. Expect to send tails wagging and jaws dropping whenever you leave the house in this bad boy! These caps are unisex and come in one size with an adjustable strap at the back so you can make them fit to perfection.